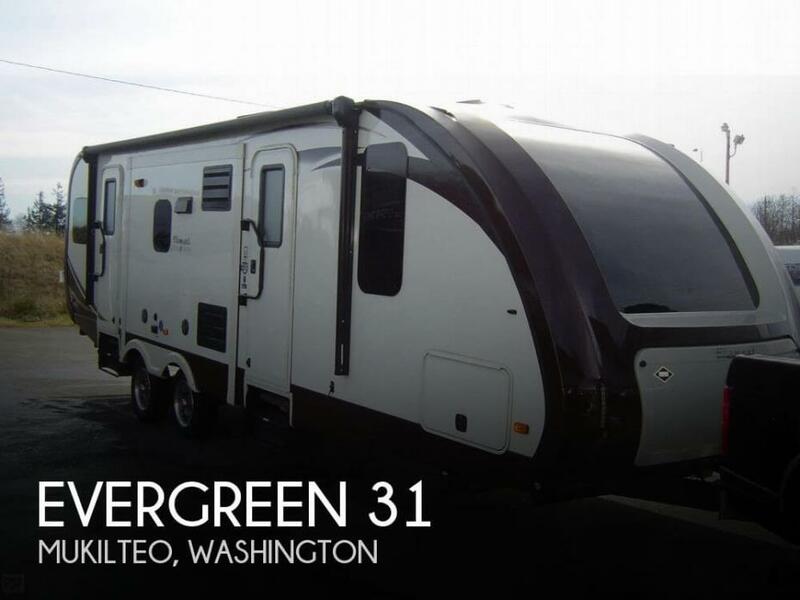 2015 Motorcycle hauler made by Evergreen RV. Did not come with generator or outside TV, although there is a spot for both. Has Stackable washer and dryer, King size bed and fireplace. Large pantry and full size residential refrigerator. Has double reclinging theater seating for two, and a futon which foods down to a bed. We are also selling out 2009, 3500 Dodge Ram dually with 125000 miles on it, for 30,000. This is a great towing machine. We full time so right now out RV is with us in Colorado. 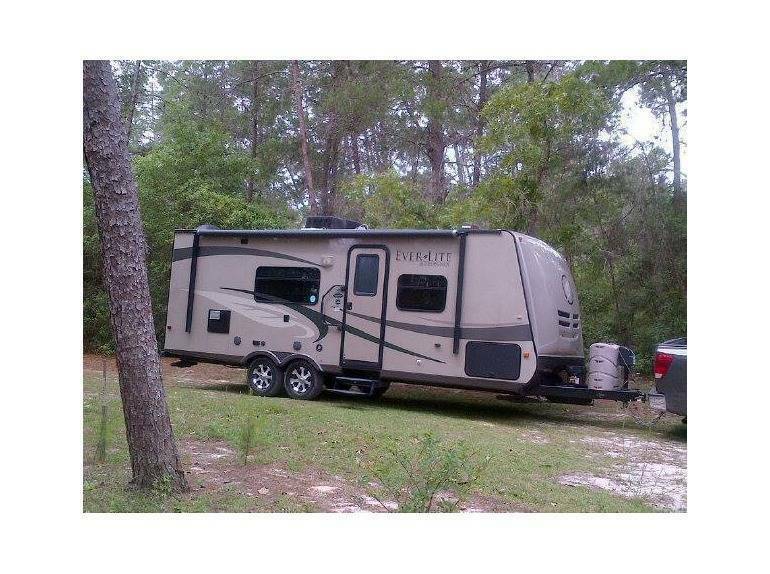 Buy both the truck and the RV and we will drop 5000.00 off the total price. We want to get a trike and it will not fit inside the garage. Lots of storage space both inside and in the basement. For more information about the truck or RV ,please contact us. Immaculate 2014 Evergreen Ascend Garage Kept. Better than new Excellent Condition inside and out $ 13,500. Coach is housed indoors. 7000 miles, well kept in like new condition. Lavatory use is clean. 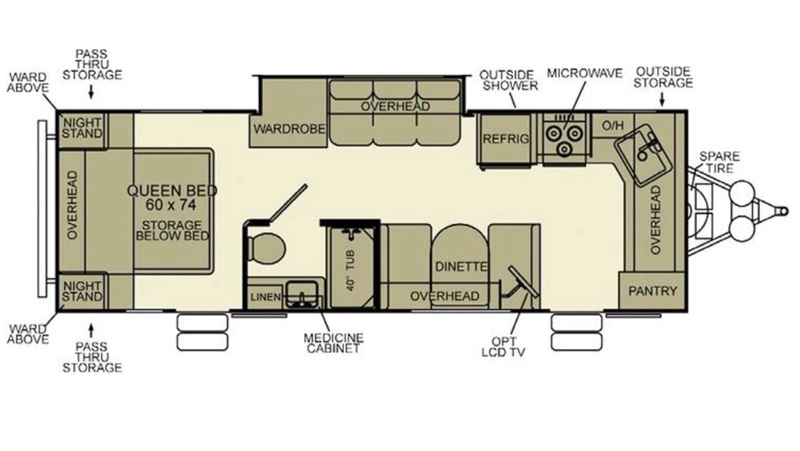 Floor plan and specifications can be referenced by searching Evergreen Ever Lite 31RB. The interior and exterior are in beautiful condition. The plastic edge covers provide a unique design that protect the seams from leaks, and it has done its job. Everything is reported to be in working order, and all systems appear to have been well taken care of, and the unit is very clean. Stock #169308 2015 Evergreen Element 28RLSS. Ready for the next family or snowbirds! 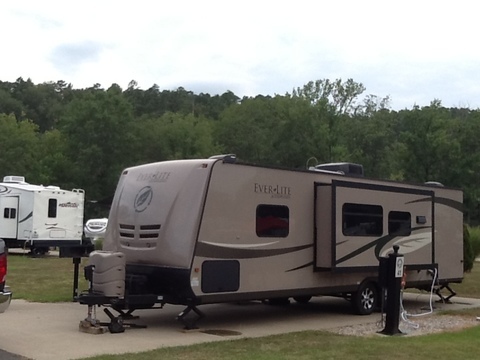 If you are in the market for a travel trailer, look no further than this 2015 Evergreen Element 28RLSS, priced right at $47,800. 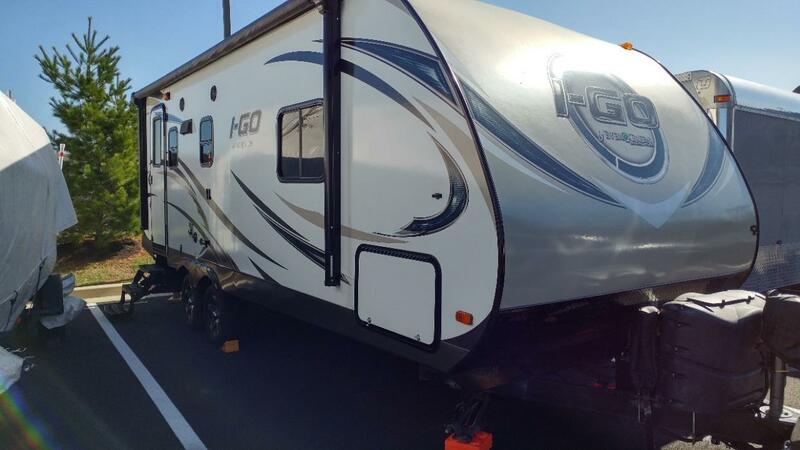 This Travel Trailer is located in Mukilteo, Washington and is in great condition. Reason for selling is don't use. purchased a cabin. 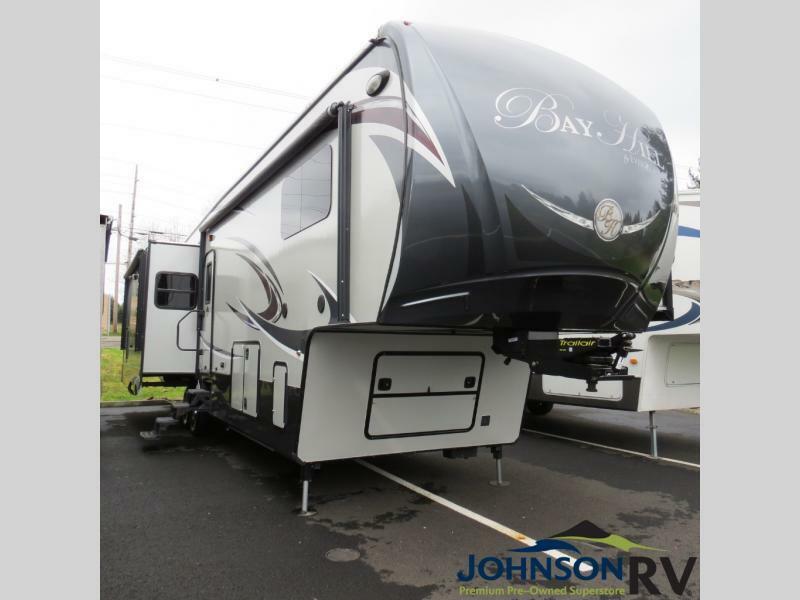 2016 Evergreen 379FL , This 2016 Bay Hill 379FL fifth wheel features five slide outs in a front living room arrangement. Includes Great Outdoors Package (frameless dark tinted windows, Gel Coated painted front cap, champhered frame, 6 point automatic leveling system, slam latch baggage doors, black tank flush, power awning, aluminum wheels, exclusive graphics package, exterior speakers, ginormous pass thru storage) Fine Living Interior Package (stainless steel microwave, stainless steel oven, Beauflor linoleum, Shaw carpeting, no slam kitchen drawer guides, fireplace, exclusive wave cabinet, Martha Stewert Corian countertop, hamper, cedar lined line wardrobe, stainless steel kitchen sink, LED lighting, radius ceiling, hardwood facia, washer/dryer prep, large LED TV) dual folding dinette chairs, low profile ducted 2bd air conditioner, 12V holding tank heat pads, residential refrigerator w/invertor, stainless steel dishwasher, tankless water heater, queen bed, bedroom LCD TV, fantastic fan w/rain sensor in kitchen, Roto Flex hitch, 2nd awning. Created for the discerning RV owner who enjoys style, luxury, and innovative design, Bay Hill fifth-wheels meet and exceed all of the expectations for design and quality in its class. 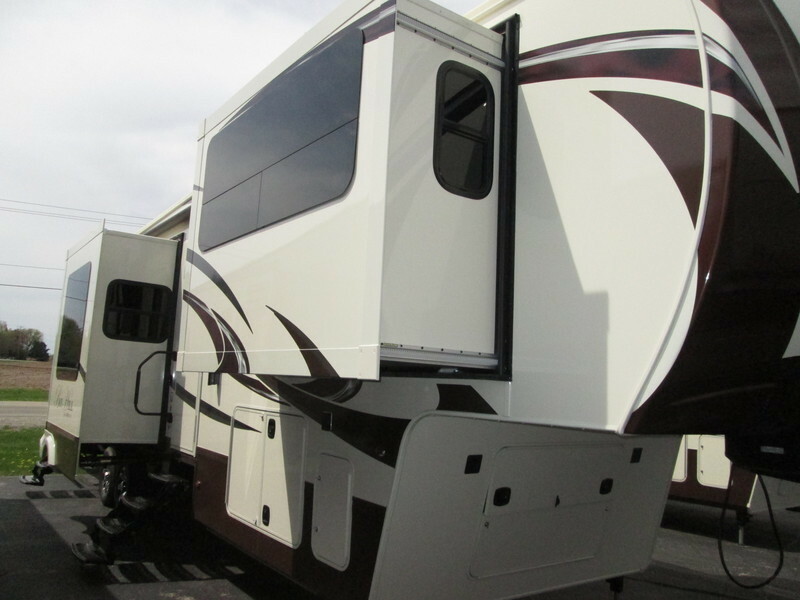 Fifth-wheel owners asked for a well-built and attractive RV with attention to detail and "industry-first" touches. EverGreen delivered. Anyone seeking a spacious and elegantly appointed coach without the high-ticket price you might expect in a variety of similar high-profile fifth-wheels can now own the Bay Hill fifth-wheel from EverGreen. 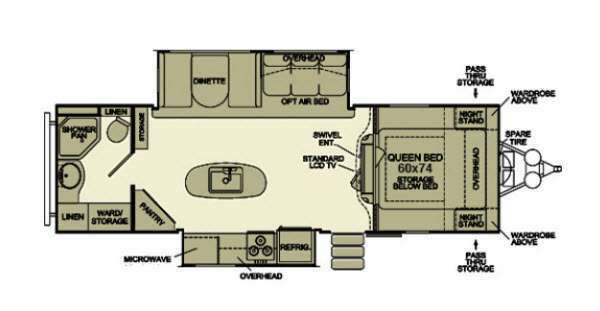 2013 EverGreen RV Sun Valley S29RBK, Single Slide Sun Valley Travel Trailer, Rear Bath w/Lav., Med. Cab., Shower, Toilet, Wardrobe, Pantry, Refrigerator, 3-Burner Range, Microwave, Single Galley Sink, U-Dinette/Sofa Slide, Swivel Ent. Front Queen Bed w/Storage Below, Dbl. Nightstands w/Wardrobes Above, Overhead Cabinets Throughout, Pass Thru Storage, Ext. Shower, Outside Kitchen & Much More. 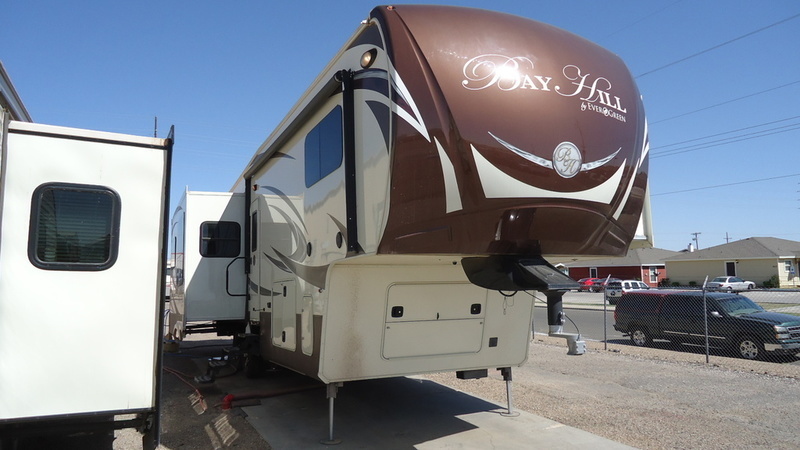 2014 EverGreen RV Bay Hill 340RK, When you step inside the 340RK Bay Hill fifth wheel by Evergreen, you will have the feeling of being welcomed home. 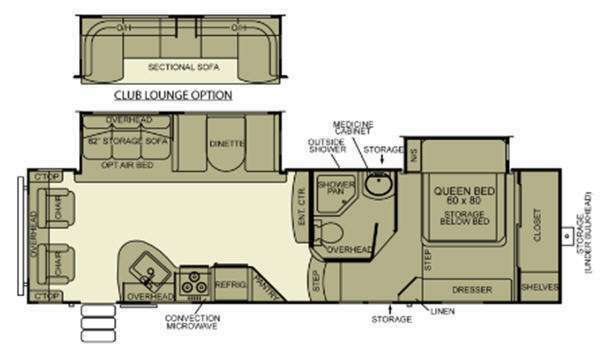 Starting in the rear of the fifth wheel, you have the kitchen. There is a breakfast bar with two bar stools, a sink, lots of counter space, a stove, and refrigerator, all tucked neatly in the rear. Along one side there is a slide with a pantry, entertainment center, and free-standing table. The living area has a slide with theater seating, as well as a swivel recliner in the corner. Just before you step up the stairs, you will find a handy coat closet. The stairs lead to the bathroom and bedroom. The bath offers a toilet, linen closet, sink, and shower. In the bedroom you will find a slide with a wardrobe and queen bed. The front wall has a wardrobe and shelves. There is a dresser along the other wall in the bedroom. There is so much space and overhead cabinets in this model that you can bring along all the items you need to have an enjoyable time away from home. You can also add a few optional items, such as, a fireplace below the entertainment center, a king bed, and a washer and dryer preparation. We purchased this Travel trailer for my wife and me and planned to vacation with no kids or pets. Its fully paid off/No loans. 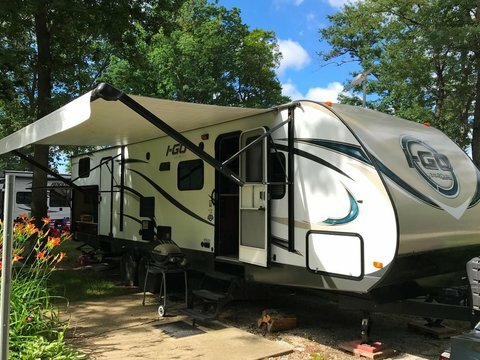 After two seasons of travel we've decided to upgrade to a Class C mainly because we want to start doing longer trips across country (multiple destinations) and want a faster turnaround at campsites. We had the unit fitted to suit a couple and wanted to enjoy reasonably good quality sound with movies even when it is pelting down rain. So its retofitted with a DVD player and a sound bar. 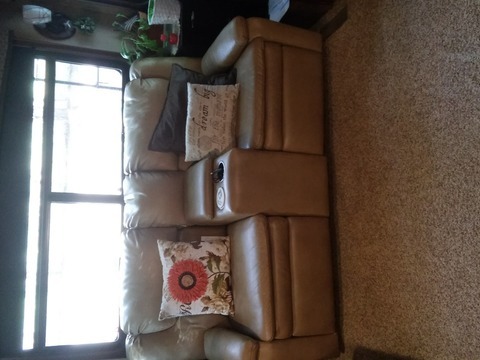 We replaced the dinette with a Hide-a-Bed sofa for more comfy seating for watching movies. We use a fold up table for meals inside the unit. Outside bumper mounted gas grillConstruction is Aluminium and Fibreglass and unit has the Better Built Packge which is a Double welded Aluminium cage frame with vacubond lamination, heated and enclosed underbelly, TPO roof, uses block foam insulation. Sheet vinyl flooring- Only carpeting is in the slide area- Queen bed with cover and under bed storage- Pleated night shades- Radius Windows- Outside Shower- 13.5 Ducted AC- 55 Amp Inverter- 6CuFt Refrigerator- 6 gal DSI water heater- 3 burner stove with oven- Aluminium wheels 15"- 17' Power awning- 32" TV- Interior and exterior speakers. 2 x20lb Propane tanksUpgrades include:- Porcelain toliet replacing the standard plastic unit- Husky 450lb Electric Jack - all LED lights inside- under awning light strip- upgraded shower faucet with unit for higher flow- Velcro attached light and heat blocker over the vent in the bedroomIncluded in the sale are:- Wheel covers (prevent UV damage)- S2 Expedition RV Cover- special designed blocks to put under stabilzer jacks on sites that have a big slope- BAL X-Chock Wheel StabilizersThe RV is fitted with a Pro-Pride3 Antisway system as shown in the photo. The sales price includes this. If not required then sales price drops by $1500 to $14690Other notes- Approximate mileage traveled = 1,390 - No leaks- Refrigerator, AC, Furnace, Gas range, microwave all work- Dri-Air Dehumdifier used (when RV is stored) to remove excess moisturefrom accumuilating in the RV. 2013 EverGreen RV Sun Valley S29KIS, Double Slide Sun Valley Travel Trailer, Rear Bath w/Toilet, Linen, Shower, Lav., Line, Ward./Storage, Pantry, Microwave/3-Burner Range/Refrigerator Slide, Kitchen Island w/Kitchen Sink, Dinette/Sofa Slide, Swivel Entertainment Center, Front Queen Bed w/Storage Below, Dbl. Nightstands w/Wardrobes Above, Pass Thru Storage, Overhead Cabinets Throughout & Much More. Available Options May Include: Air Bed Sofa. 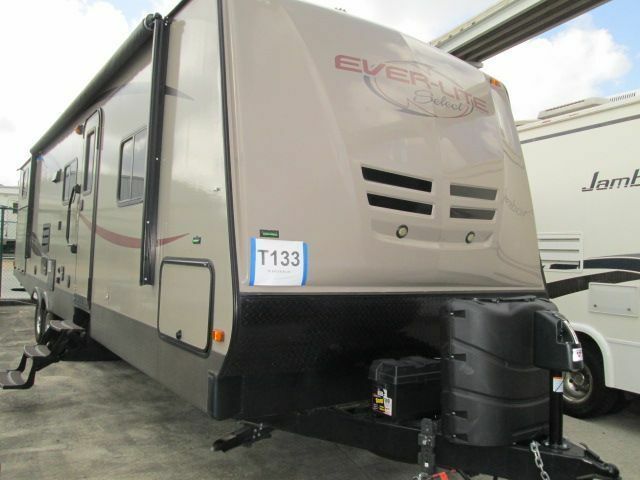 2014 EVERGREEN 310RE, 2014 BAYHILL 35' 5TH WHEEL W/THREE SLIDEOUTS, AMENITIES INCLUDE: REAR LIVINGROOM W/HIDE-A-BED SOFA, THEATER SEATING, MIDDLE KITCHEN W/ISLAND, SIDE ISLE BATHROOM, FREE STANDING DINETTE AND FOUR CHAIRS, FRONT ISLAND KING BED, LARGE FRONT WARDROBE, PLEATED PRIVACY WINDOW SHADES, TINTED WINDOWS, TANKLESS DSI LP WATER HEATER, WASHER/DRYER PREP, LIVINGROOM CEILING FAN, 12 CU FT LP/110V FOUR DOOR REFRIGERATOR W/FREEZER, THREE BURNER COOKTOP, 22" LP OVEN, RESIDENTIAL 30" OTR MICROWAVE W/LIGHT & FAN, DISHWASHER, CENTRAL VACUUM SYSTEM, SEWER TANK FLUSH, HOLDING TANK MONITORS, 15K DUCT & 13.5K DUCT AIR CONDITIONERS, ELECTRIC FIREPLACE, AM/FM STEREO, CD/DVD PLAYER, 50" & 26" LCD TVS, TV ANTENNA W/BOOSTER, POWERED SIX POINT AUTOMATIC LEVELLING JACKS, TANDEM AXLES W/ELECTRIC BRAKES, 16" RADIALS, 3-30# LP TANKS W/AUTO CHANGE OVER LP REGULATOR, POWERED PATIO AWNING, REAR LADDER, FIBERGLASS EXTERIOR, RUBBER ROOF, 50 AMP SERVICE, ENCLOSED UNDERBELLY W/HEATED HOLDING TANKS AND MUCH MORE.